Dave May has kindly agreed to answer some questions about the amiga, programming and his game, Air Taxi. The questions are below. How did you get involved in programming games on the Amiga? 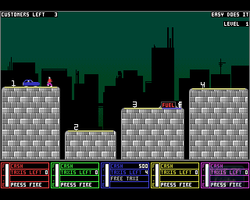 I had written small games on the Commodore 64 so the Amiga was an exciting new platform. I owned an Amiga 500, then bought an Amiga 4000 when I was 16. I was studying C, but writing games in AMOS Pro since it made it easy to collect my resources together and to code quickly, and I could still compile my game into a standalone executable. What was the inspiration for Air Taxi - were you inspired by the C64 game Space Taxi? I enjoyed Space Taxi on the Commodore 64 but was always frustrated with the single-player limitation, wondering why I could not pick up a second controller and participate when it wasn't "my turn". 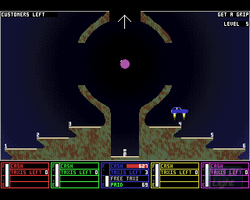 So on the Amiga, I created the game that I wanted Space Taxi to be, and I did so initially as a fun project for myself and my friends. 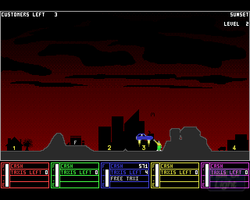 Some of the taxi's behavior was kept from the original, but making AirTaxi multi-player allowed more creativity with the level design and gameplay. Which part of the game production did you struggle with the most or enjoy the least (programming / music / graphics)?. Programming graphics on the Amiga met some limitations with its processor speed and non-linear display, so there was only so much I could accomplish with reasonable effort. I would have liked to use more visual effects but it slowed the game down drastically when I added them. Compatibility between different Amiga systems was an issue too. Since DOOM had just appeared on the PC with its fancy, linear VGA graphics, and the Amiga had imposed too many limitations visually, I was quick to move to the PC platform. How difficult was it to programme the multi player aspect of the game? Since AirTaxi was designed multi-player from the beginning, it was pretty easy to do. Collisions were simple. Having the customers "attach" to different players and having AI elements "hunt" individual players was not troublesome, again due to it being part of the original design. Using the parallel port to add two more joysticks was something I had seen done, and I wanted to maximize the multi-player enjoyment, so I incorporated that from the beginning as well. Did you ever attempt to get the game released commercially or was shareware always the original aim? 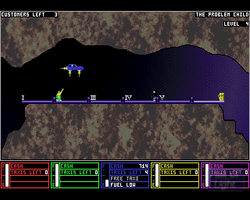 Shareware was satisfying for me, since AirTaxi began as a personal "fun project". It did make its way to a cover disk with the Amiga Power magazine (Issue #52) and the editors were very excited about distributing it. Were there any other Amiga games / unfinished amiga projects you were involved with? I was not involved with any other Amiga releases, but every game developer ends up with unfinished projects. I created a four-player ninja fighting game and started work on a top-down shooter, but never fully completed them. I did recreate many arcade games I enjoyed as a child, often adding 2- or 4-player capability. Are you surprised that your game is still being played 16 years after being released? It is a little surprising. I receive emails from people every few months who thank me for the fun they had playing AirTaxi, but I am so thankful to them because they played my game, and took the time to tell me about it. I was very surprised to learn that a few career game designers were actually inspired in part by AirTaxi, including one who enjoyed "modding" the game by changing the level graphics. I am often asked if I have remade AirTaxi for a new platform with newer graphics, and I have not done this yet, but I have considered it. Are you still involved in the computer industry today? If so what are you currently workin on? Shortly after the development of AirTaxi, I encountered the Internet, just as it was starting to take hold in commerce. I began developing web applications while working at a local college, and when I turned 21, I started a web development, Internet access and server hosting company, which has now been in operation for over fifteen years. Games are still a passion, though, and I have remained active in studying game design on the PC and Xbox, with mobile games as a strong side interest. Thank you for the interview! I am delighted to see the nostalgia of the Amiga kept alive and fresh. I truly believe that modern game development owes a lot to the Amiga platform, where some of the most creative ideas and stories came to life, and entertained so many people around the world.